For all your cooking needs, you may definitely need a vegetable peeler. Whether you are skinning potatoes or carrots, you need one almost every single day. These are not just important, but also affordable. If you are looking for a brand new peeler in the market, you are at the right place. Here, we will look at the best vegetable peelers in the market and help you make right decision. Swivel and Y style peelers are two different types of vegetable peelers. 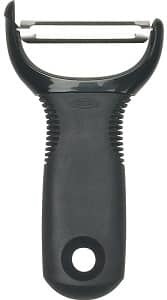 Swivel peeler is most common among home cooks. They have vertical blade used by moving hand back and forth on the vegetable. On the other side, Y-peeler comes with horizontal blade. You can start at the bottom while peeling its skin facing you. It is a bit difficult to maneuver and takes time to get used to it. So, you may go with the swivel function as it is easier to use and it is very natural. Y models are mostly used in restaurant and food industry as they are willing to adjust to different movements. These are also able to save time and are even sharper. Some people may want to use both types of peelers for different tasks and also use Y-style peeler for removing potato skin. 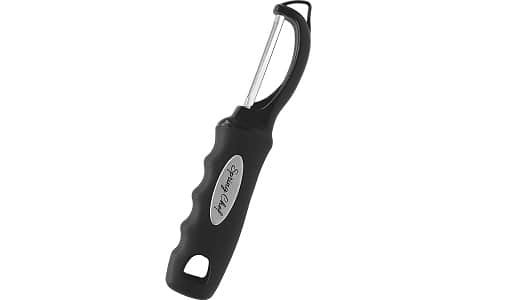 Y-style peeler is more user-friendly if you are left handed. Buyer’s Guide – What to look for it? 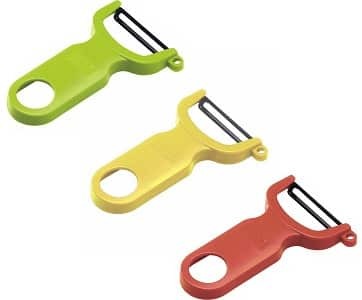 You have to choose vegetable peelers which are durable. You won’t want your tool to break down especially when it comes to make dinner and you end up cutting your finger suddenly. This way, durable models are affordable from leading brands. They are designed to last longer. It’s not the way it looks and the brand which offers. But it should be built in a way that it helps you do the job easily. When you decide to buy a product, you are expected to do exactly what it should be. Some blades are poorly designed and you may end up clogging. So, it is important to look at the design of peelers before buying. Blades in vegetable peelers are made of different materials, such as ceramic, stainless steel and carbon steel. Stainless steel is the most preferred blade. If you are sometimes clumsy in your kitchen, you may not want to buy ceramic blade if you drop it and it gets broken. In addition, carbon steel is prone to rust if it is not dried just after wash.
Don’t miss to check my review on: Best Vegetable Chopper For Your Kitchen. The swivel peeler from OXO Classic stands the testimony of time thanks to its razor-sharp, stainless steel blade which glides smoothly through even the toughest vegetable and fruit skins, without wasting fruit. 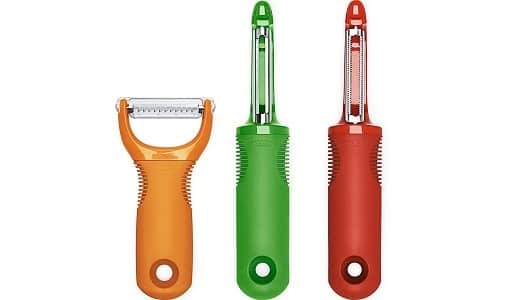 The Serrated Peeler peels off the skin of waxy and slippery vegetables and fruits, such as plums, peaches, tomatoes, etc. 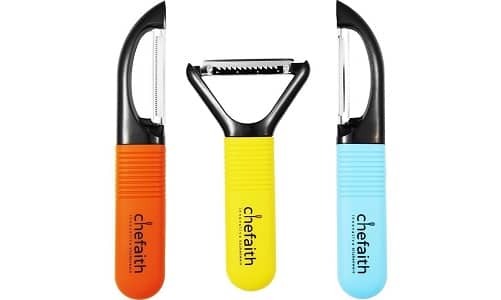 The set also includes Y-peeler with stainless steel blade which glides smoothly through the toughest vegetable and fruit skins. 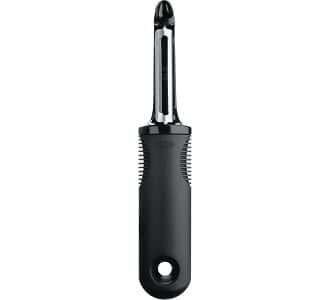 Prep your tough-skinned vegetables and fruits with OXO Good Grips Swivel Peeler. It features twin S.S. steel blades that are flexible enough to remove large skin in each stroke. It has large, comfortable handle for quick use without slipping even when having wet hands. It has over sized in-handle hole to store it. The flexible, rotating steel blades are designed to make peeling easy. It has in-built potato eye remover which is very durable and it can carve out the blemishes with ease. If you have this world-class swivel vegetable peeler from Spring Chef, trust me, you will love peeling vegetables and fruits every now and then. Smooth glide technology makes it more fun than a task. Blades glide smoothly through the surface to peel vegetables and fruits more smoothly. 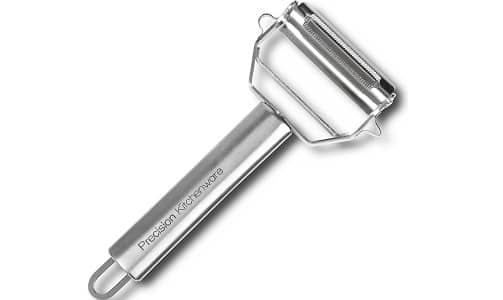 It has dual blades made of stainless steel so you can easily peel with precision. It is also easy to hold in right or left hand with a different handle design. It is very efficient and lightweight thanks to its ergonomic design. It is the same old-school Jonas vegetable peeler that you may have found in your grandma’s kitchen in the 1950s and 1960s. One thing that makes it stand out is the fact that it is more than just a peeler. With 58 years of legacy, Linden Sweden combines the quality and function in this peeler. It has 18/10 stainless steel swivel blade which stays sharp for years to come. It works well even when you are lefty. Now it is back with soft-grip handle. It won’t rust for the next 10 years to come. Finally found a vegetable peeler which is more than just a peeler. This ultra-sharp stainless steel vegetable peeler is going to make peeling a breeze. It can create even the thinnest slices of vegetables and fruit. So, you won’t waste chunks of carrots, cucumber, or potatoes. It can shred even the tough skin of butternut squash. Glide the julienne blade down and you can have the professional grade matchstick strips. It is always best for salads, coleslaw and stir fries. So, you won’t have to waste time in cutting and chopping. Don’t go with small size. Kuhn Rikon 3-set Swiss peeler is designed well to peel vegetables and fruits smoothly. This handy tool is a powerhouse which peels better than more expensive models. It gives professional-grade, sharp edge that most chefs love. Whether you are peeling a potato or any fruit with tough skin, this Y-peeler from OXO is a best bet. It has wide, sharp stainless steel blades which can move through any surface. It has durable potato eye remover to carve out blemishes without having to dig. KitchenAid Classic Euro Peeler is a stylish and sleek peeler which makes peeling vegetables and fruits easy. It has swivel head blade made of rust-resistant, tough steel. The ergonomic handle offers sure and smooth grip. This set contains serrated and straight vegetable peelers with potato eye peeler. The Y-style julienne blade peeper can create thin sticks. It provides precise and neat cutting with razor-sharp blades. 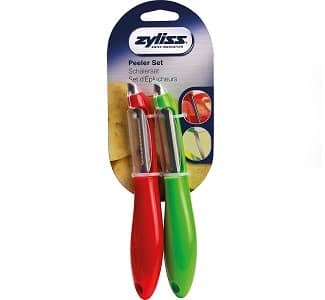 This 2-piece peeler set from Zyliss is the perfect set of all-purpose peelers to peel everything, whether it is apple or winter squash. 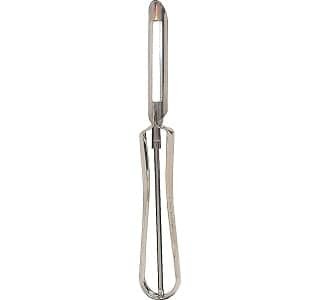 It has stainless steel tip to peel off potato eyes and dark spots. The European design makes it easier to use with its ergonomic body to fit your hand well. So, here are some of our top picks to make a wise decision. If you want a vegetable peeler which makes your tasks easier, we recommend you go with these products from reputed brands.